P.T. 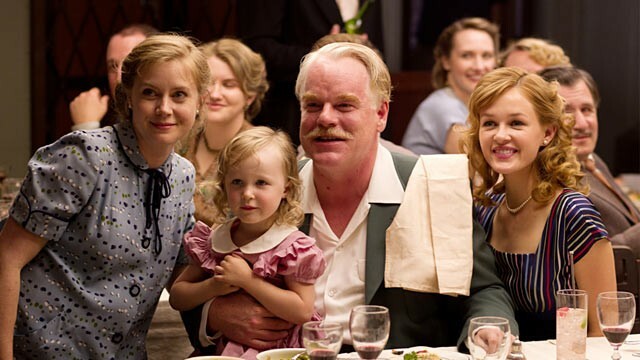 Anderson‘s latest drama The Master, hit theaters nationwide this past weekend. After receiving numerous awards at this years Toronto Film Festival, the film is now being discussed as an obvious contender for next years Best Picture oscar. When I found out it would be starring Phillip Seymour Hoffman, the Best Leading Actor winner, and Oscar nominees Joaquin Phoenix and Amy Adams, I was thrilled. Being in the hands of a director with such great skills that P.T. Anderson has, there was no way this film could go wrong. Right? Well, lets put is this way: The Master is Anderson’s least accessible film thus far, and is definitely not for everyone. I’m not even sure who this film is for. The Master starts out with us getting acquainted with Phoenix’s character, Freddie Quell. Freddie enjoys women and booze among many other things, but has never really adjusted to civilian life post WWII. Ever since I saw the wonderful Walk The Line, I knew Phoenix could act, but WOW- he gives one jaw-dropping performance here. Hoffman’s role is also very good as the cult leader of a group known as “The Cause”. What exactly The Cause is, the movie never really says. Instead it focuses on the relationship between these two men as they draw intimately close to one another. Not only is the acting some of the best I have ever seen, but this film looks absolutely beautiful. Anderson got the production design spot on and the cinematography is pristine. Every shot is stunning and framed in such a way it reminded me of some of Kubrick’s films. Which means I would have been completely satisfied just watching this on mute with no subtitles. But then we come to the most important aspect of any film: its story. I won’t say The Master has a bad story – because it doesn’t – but it is extremely illogical and perplexing. There is not nearly enough explanation to what is happening on-screen, nonetheless why things are happening. The entire thing feels more like a dreamy memory of a film rather than a cohesive one, with only bits and pieces standing out on the surface. I felt like there was so much left out that I didn’t get, but whats even worse, there was so much that was unnecessarily added. The Master could have been such a great film if only its story wasn’t swallowed up by its actors and visuals. I think this is one of those films that is better appreciated the second time around, but at a dragging 137 minutes, I’m not sure I want to see this again – at least not any time soon.